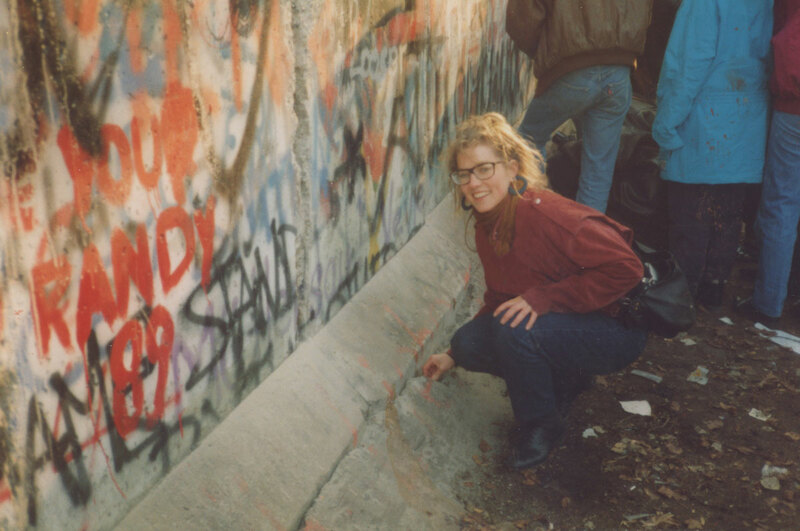 At the Berlin Wall, just as it was coming down. 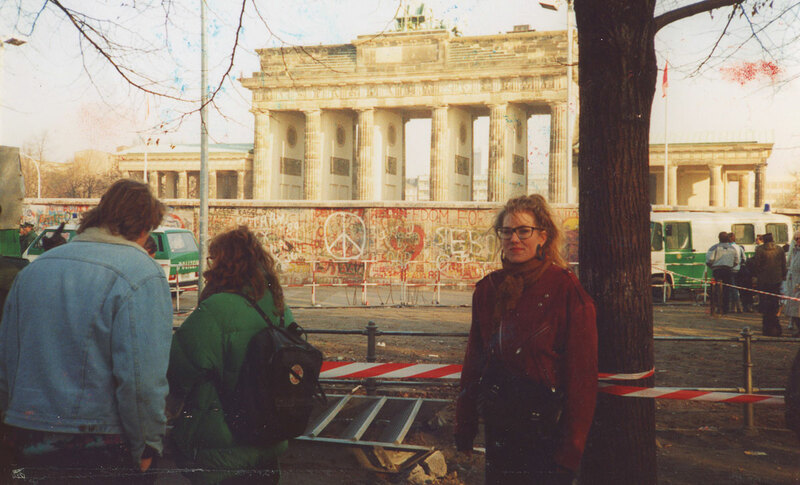 As luck would have it, I happened to be living in Europe in the fall of 1989, just about the time the Berlin Wall started cracking. And luck it was—though I and most people I know didn’t quite foresee the event as the beginning of an entire new world order, it was soon apparent it would become one of the seminal geopolitical events of the 20th century. And I was there to witness it. As a history buff and news junkie, it was an extraordinary personal experience. But more than that, a fantastic learning opportunity. From France, I found myself with a group of students who had hired a bus to travel all night to be in Berlin in mid-November, where the world’s greatest party was gathering. The wall that had so rigidly signified the totalitarian tendency, the triumph of the most brutish top-of-the-pyramid control, now the floor for the most spectacular dance party I had certainly ever seen. Like most of my generation, my geopolitical youth was dominated by the Cold War and the threat of nuclear annihilation. But standing in front of that wall, about 10 days into the unfolding mega-story, as it was literally being hacked up and chiselled down by ordinary people with hand-held pickaxes, it was astounding how the very spot where John le Carré had framed his infamous novel The Spy Who Came in from the Cold—a place so astonishingly sinister, so dark, so malevolent in tone and intent—was now crumbling like an overbaked cupcake. Like many there, I wandered around in wonder; saw East German border guards (I remember them as young) who seemed slightly unsure of what to make of it all, and who just weeks, even days earlier, likely would have shot you if you had gotten close or posed a threat. And like many, walked across a crowded Checkpoint Charlie (the NATO-controlled border between East and West) and crossed straight into East Berlin with nothing more than a passport showing. Nobody thought it could happen — and then it did. How extraordinary, how bizarre—how could this all be happening?! I remember thinking. The wall that had so rigidly signified the totalitarian tendency, the triumph of the most brutish top-of-the-pyramid control, now the floor for the most spectacular dance party I had certainly ever seen. It was like discovering, in a fantastic mental flash, that the Wall Emperor had no clothes, had never had any clothes, had only been kept intact because everyone had gone along. Of course, it turned out others also saw the rather obvious analogy of the Berlin Wall to Hans Christian Andersen’s tale about the walking-naked emperor. But that was still the Big Lesson that being there taught me: that evil walls are created by evil people for evil purposes, and have no strength without the masses going along. It seems a lifetime ago, but from Central Asia to Eastern Europe and pretty much right to the doorstep of the West, there at one time existed one very Big Wall that for almost half a century subjugated and dominated much of Eurasia—as well as way too much of the global conversation. Bringing down the Berlin Wall changed the conversation. Travel changes the conversation. So, my advice for the coming year is to get travelling—well, you know, if you can!—and to absolutely continue travelling-reading. See and read the human stories behind the walls, and make yourself a part of the global conversation. Don’t leave it to the emperors to set the tone or terms.